The children in Year 1 had a super visit to Beardwood Hospital. On arrival they were welcomed by Mrs Sheehan, Executive Director at the hospital, who introduced them to Sister Sue and Nurse Lovely Linda! The children listened to Sister Sue as she talked to them about her job as a nurse. They were taken onto the ward where Sister Sue took Mrs Milnes’ and Mrs Dixon’s blood pressure and oxygen levels; thankfully they were fit and well! The children were introduced to two very special patients in the hospital, Dolly Katy and Teddy, who were being looked after because they were poorly. Whilst on the ward the doctor was called to check Dolly Katy and Teddy and he showed the children how he listens to his patient’s chest. He diagnosed Dolly Katy and Teddy with a chest infection. The children asked the nurses and doctors lots of questions. They also visited the X-ray department and took an x-ray of Dolly. They enjoyed looking at the x-ray on the computer in the special room. 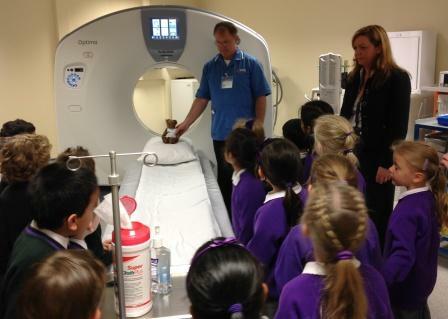 They visited the building where the new MRI scanner is and learnt that it is called Tom, after Thomas Sheehan in Year 2! They were shown how this special machine works and they scanned Teddy. His scan showed that he had eaten too many beans!! Before leaving to go back to school, the children had time for some lovely fruit salad snack that the hospital kitchen had prepared. It was delicious! All the children received a water bottle, teddy bear and a special certificate to remember their visit, as well as a bag of goodies to take back to their own Medical Centre in class. Many thanks to Mrs Sheehan and her team at Beardwood Hospital for looking after them so well.